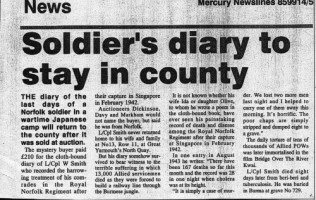 On December 16th 1994 the following article in a local newspaper made an incredible impact on one women who read it, , so much so that three years later it brought about the beginning of COFEPOW - The Children (& Families) of the Far East Prisoners of War. ‍Carol Cooper, from Norfolk started to read the newspaper article then with a tremendous shock she realised the soldier concerned was her father, a father who was sent to war when she was two years old. The discovery of her father's diary began a series of remarkable events. But her first task was to contact the person who had bought the diary at the auction and asked, being the daughter of the solder concerned, if he would sell her the diary - he refused and so began a long campaign to acquire something that she believed should have rightfully come back to her mother. Solicitors confirmed that legally the diary belonged to the person who bought it, morally it belonged to Carol, but no one could change the law. The buyer then, temporarily, lodged the diary in the Royal Norfolk Regimental Museum in Norwich and they sent Carol a transcribed copy of what her father had written. Reading this copy was a traumatic experience. It had been kept from the day he had left England on the 28th October 1941. 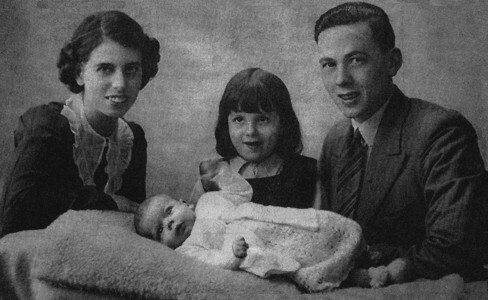 This date was her parents birthdays, both being born on the same day and this fateful day in 1941 was their 26th birthday. The whole diary was written as if a letter to her mother together with many moving and loving poems and despite what he was going through he always sent his love on their birthdays. We soon may be together. But I'll be home some "Bright Sunday"
To the very end he was so sure that, although so many were dying all around him, he was going to make it, he was going to come back. He was starving, he was very ill, his few clothes were filthy, but he still managed to write in the diary - "Don't worry Ida darling, I'm coming back to you one day". The last entry in the diary was the 8th December 1943. He was in a camp called Tambaya in Burma. He died 9 days later on the 17th December. Carol was later to learn that he had died of malaria, malnutrition, dyptheria and cardiac beri beri. Reading the copy of the diary answered a question that had puzzled Carol's mother all her life. She had received a letter from the War Office informing her that her husband was a prisoner of the Japanese in Singapore. Two years later she was informed that he had died and was buried in Burma. She would not believe that he had died in Singapore and had been buried hundreds of miles away in Burma. She always thought that it was a mistake and one day he would come home, but the diary would have told her that he was sent from Singapore with the ill fated "F" Force into Burma. He wrote of being marched up-country, travelling from camp to camp along the length of the Thai/Burma railway, night after night, often in mud and rain, stopping during the heat of the day and then off again, he often wrote "last night we did approx 20 miles, it was hell". They were forced to endure the unimaginable - all were exhausted, starved and suffering from ill health. Now knowing so much more about her father strengthened Carol's resolve to one day gain possession of the original diary. Fortunately, after endless letter writing, the conflict of the diary came to the attention of a BBC producer who thought it would make a good story line for a documentary. The outcome was the commencement of a documentary film in August 1996 dramatising the events that had taken place and Carol was offered the journey of a lifetime when it was planned to take her back to Thailand to retrace the steps her father had taken while a Far East Prisoner of War. 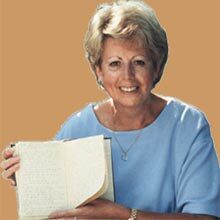 The intention was to end the documentary in Burma with Carol visiting her father's grave, but shortly before they left for Thailand on the 8th November 1997, the owner of the diary agreed to sell it and millions of viewers were to see a very tearful Carol receiving her father's diary for the first time. Filming in Thailand along the route of the infamous 'Death Railway' was to prove an emotional and unforgettable experience. 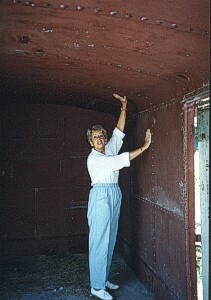 Standing in 'Hellfire Pass' where 700 men died of brutality in a few short weeks, brought choking tears and the same had to be said when early one day, Carol climbed into one of the original metal trucks which had transported hundreds of prisoners from Singapore to Ban Pong in Thailand. Her father had written in the diary of travelling in these trucks for five days, 30 men to a truck and going for 36 hours without food or water. At 8.30 in the morning, the sides and roof were already very hot to touch and it was not hard to imagine what it must have been like at midday. The whole journey from Kanchanaburi to the Three Pagoda Pass, on the Burma Border, was one of emotion, passing through camps like Nikke where her father wrote "It seems like it will never end, but one must keep smiling and eating the rice. I pray to God that it won't be long now, over 2000 have died so far since we left Changi." One of the most moving occasions was when visiting the Chungkai and Kanchanaburi Commonwealth War Cemeteries. Walking through the large Kanchanaburi cemetery under a scorching sun, weaving between thousands of small neat headstones seemed to epitomise the whole dreadful fate of the Far East Prisoners of War. They had all been so young, mostly between 20 and 28 years of age, but for Carol the real tragedy lay in the knowledge that not one of the 7,000 men laying before her had died in a battle of soldiers. Not one had been given the chance to fight for his life - they had been ordered to surrender and all died in captivity - prisoners, dying of starvation, brutality, slavery, dreadful tropical diseases, malaria, diphtheria, dysentery, cholera, beri-beri and terrible leg ulcers. Standing in the hot sun she wept for their suffering and felt a dreadful injustice when realising that nowhere had she seen a Memorial, a plaque or a stone anywhere along the length of the railway from the British Government honouring the thousands of British servicemen who had died there. Until the discovery of her father's diary and the visit to Thailand, she had known only that the Far East prisoners were not treated very well and were poorly fed, the true extent of the treatment of these British Prisoners of War was unknown to her and it appears unknown to many other people. Why, she has often wondered, does everyone know what happened to the Jews in Germany, but so few know of the similar suffering of the Far East Prisoners. The saddest moment of the whole journey was when they tried to enter Burma. The BBC were refused entry because of a flare-up of their internal political problems. The Burmese Government refused to have any media coverage in their country, even though the BBC only wanted to film in the Thanbyuzayat War Cemetery. This was a bitter blow both to Carol and for the film producer and they had no option but to turn back. "Like thousands of his fellow soldiers who became prisoners of war after Singapore fell to the enemy, Lance Corporal Bill Smith endured unimaginable suffering at the hands of the Japanese. Unknown to the enemy, Bill kept a diary that ended with his death from malaria in December 1943. His words were a testament to the love he bore for his family. After his death, the diary disappeared, only to resurface some 50 years later when it was sold at auction. This is the poignant story of his daughter's fight for the diary she believes is rightfully hers. It is also a reminder of the horrors endured by many thousands". After the filming of the documentary, Carol was to receive many letters, but more importantly, many books. Books written by the ex prisoners themselves, books on their experiences, their suffering and their three and a half years of hell. These books endorsed all that she had learnt in Thailand and more so. With the visit to Thailand over, the filming finished, the documentary shown, life for this ordinary English woman should have returned back to normal. But not so. She could not forget the experiences of Thailand, the knowledge of so much misery and the deep sense of injustice she felt towards the British Government, past and present, for their uncaring attitude in refusing to acknowledge the suffering and ill treatment of their own men by the Japanese army. She commenced a campaign of letter writing to the Government - "Why has the Government never honoured or paid tribute to the Far East Prisoners of War, servicemen who died for their country while supposedly under the protection of the Geneva Convention?". Her own M.P. eventually brought the matter up in the Houses of Parliament - The reply:- "It is not the policy of the Government to erect memorials to servicemen, any memorials have to come from private fund raising." In August 1997 Carol Cooper put an advert in the local papers calling for the children and families of Far East Prisoners of War to join her in asking the British Government to pay these men the honour they truly deserved. In November 1997 COFEPOW - The Children (& Families) of the Far East Prisoners of War was formed with twenty five members in the Norfolk area. Members now hail from all over the country. A year later five Charity Trustees were appointed and COFEPOW became a Registered Charity - No. 1074474. They have the support of many M.Ps across the country and the help and friendship of numerous FEPOW Associations. On 24th October 1998, they planted their first Tree of Remembrance to their fathers, brothers and uncles, 57 years after most of them last left home. COFEPOW has already met with officials in Whitehall and requested their assistance in building a place that will tell the FEPOW story. This in part would go some way towards their recognition of the suffering of the Far East prisoners which is long overdue, but the British Government has had over 50 years to build a barricade against questions pertaining to the Far East - it is a subject they would prefer to forget, but the debt they owe will never go away. Meanwhile we are asking all visitors to our web site to kindly read our Appeal. To light my whole life through. Forever Mine Alone, Darling Ida May. N.B. Carol spent some considerable time researching how the diary came back to this country and where it had been. She is now 99% certain she has the answer.But that is another story. All the contents of this page are the © Copyright of Carol Cooper, 1999.